Welcome to the Anxietynomore app. This was something I always wanted to put together because so many people were emailing me to do so; the problem was I had no idea on how to do this as it was out of my technical capability. Then along came someone from my blog who had been helped by my book who was familiar with creating apps and said he would love to help out. The app took us both 5 months to put together and apart from the time, it was quite an expensive thing to put together as outside developers were used to help with certain sections. I have tried to sell it as cheap as possible and if it does well and pays for itself then I hope to be able to bring the price down further. As people will see below on the screenshots, video and descriptions that a lot has gone into this app and I truly believe it will help people. I don’t push anything on anybody, but for those who do wish to purchase it then I truly hope it helps. 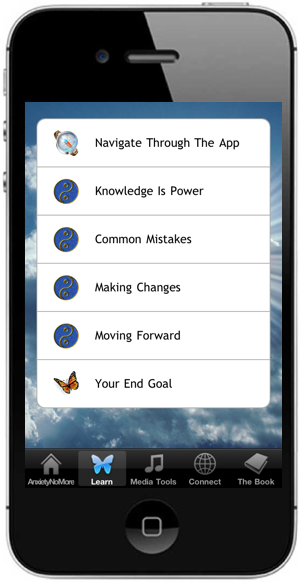 This section is completely new material that was written especially for the app. It will give you a new understanding of how to come through your anxiety. This is the developer’s story ‘Ola’ on how the app came about from a simple idea driving home to being produced. 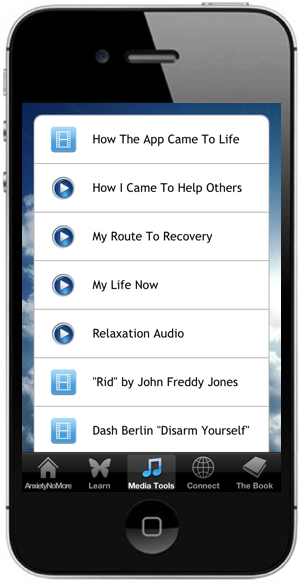 The sections ‘How I came to help others’, ‘My route to recovery’ and ‘My life now’ is an audio section from me. The film ‘Rid’ which can also be found here on the main site. This is a great short film about the day in the life of an anxiety sufferer and how he now sees the way forward. The film has already won an award and is now nominated for a national short film award. I had nothing to do with the making of the film. It was sent to me one day by John Jones who had been helped through visiting my site and he did it as a university project. 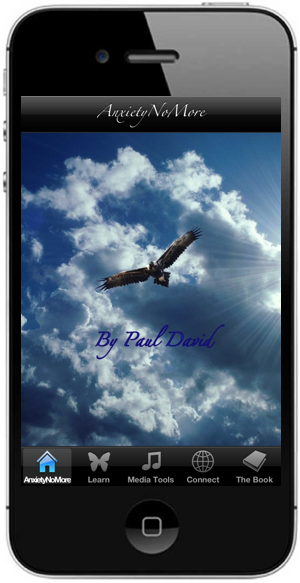 This song was made by the world famous ‘Dash Berlin’ and they have kindly let me use it on the app It was made in dedication to the book. Here is the email I received from them in July 2011. I just wanted to let you know your (life changing) book has inspired us to write this song: Disarm Yourself. All over the world people are singing a long.. Cheers Seb. Here is some specially selected music for you to just sit back and relax to. I found that just switching off for a few hours a week and listening to some relaxing music a great help and I really wanted to make it part of the app. This music was picked especially for the app after quite a lot of searching. It is very calming and really helps to take you to another place. This song was kindly sent in by Paul Sutton, a past winner of ‘Stars in your eyes’ and really captures his own struggles with anxiety. 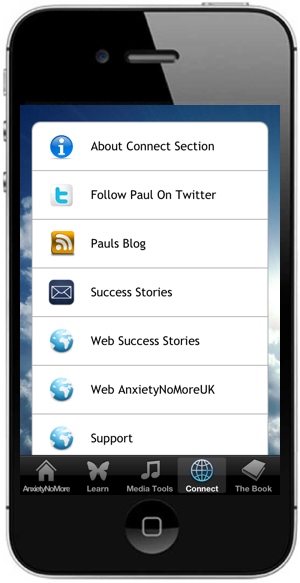 Paul was really happy that it would be shared with a wider audience through the app and maybe help and inspire others. Do watch the video and listen to the words, it is a very touching song and video. This is my official twitter account in which I try and keep people up to date on what is happening with me and my site and also a bit of humour along the way. This is another source for people to get more help and advice and has turned into a great little community, with people helping and being there for others. I post once every few weeks on a new topic and then post on the comments when I can. This section brings the blog straight to your phone and lets you read past and present articles. Here is a collection of people’s success stories. All have never been shown before and have been sent in by people who came to the site for help. They really do make a great collection to help and inspire others. This is just a direct link from your phone to my main site. This is solely to report any problems you may encounter with the app. 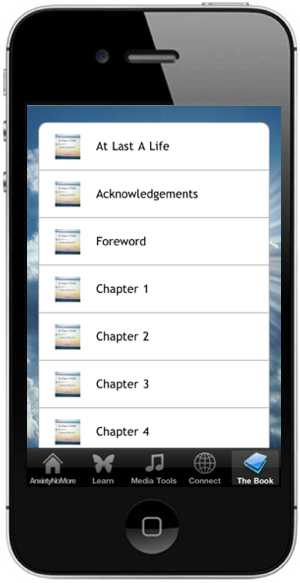 Here is my book ‘At last a life’ to read on your app. This book has sold many thousands of copies all over the world and has helped so many people to recover and give them their life back. It is mentioned all over the web as an excellent and well-written resource and has relied mainly on word of mouth to be so successful.